Pinay WAHM: How's your Easter?? Ours was spent basically the same as the past few years. Before going to bed, the 'easter bunny' [guess who?] had to prepare the Easter basket with a few goodies. The basket was placed on the kitchen floor. The little one found it and was very happy. Well not at first because she noticed first that her old Easter basket was missing [yep, the bunny recycled it]. She said maybe the bunny took it. So she went looking for it and that's how she found her Easter treats. After going through the basket, we painted some eggs. After lunch we decided to visit the new house [we do that now weekly]. It's now painted about 95%. Cabinets would probably be put sometime next week. Then the flooring [carpet, etc] will probably follow. Then sods and final inspection. Not still sure when it will all be done. They didn't do any work for 2 or 3 days last week so that's 3 days lost for us. Sigh. After looking around the house for about an hour, we decided to go to the bookstore - Books A Million - to find the little one some interesting History books. We got her 3 books but not what we're really looking for but they will do for now. After the trip to the bookstore I told the husband I didn't feel like cooking so we went to KFC - yep, junk food - for a drive through. We then went home and ate our dinner at home. 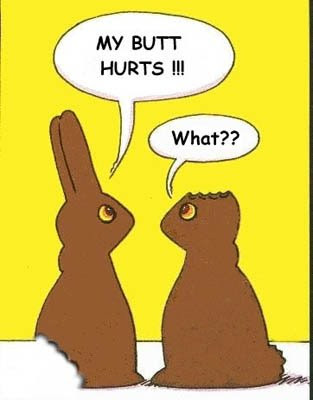 Happy Easter Everyone. By the way, our easter bunnies look like these two now...choco Easter bunnies of course....how about yours?